While at Colgate, Wynn Hall has been Le’s home. Thanks to overlapping requirements in his physics and chemistry majors, Le had time to conduct research and co-author two papers. Published in the American Chemical Society (ACS) journal Organometallics, the paper studied new ways to store hydrogen. Hydrogen is typically stored in a gaseous state, which requires a high-pressure environment and poses a safety risk during transportation. Le researched catalysts that allowed hydrogen to be stored as a compound in a liquid or solid state. While the original paper studied only two compounds and found one of them relatively successful, Le is currently working on a paper that studies how five new compounds work in the hydrogen storage process. With many more compounds in question, the experimentation has taken two years to complete. Additionally, data have been collected for the publication of a third paper on hydrogen storage, which Le and his peers have not yet written. Le stands by the importance of his work, as hydrogen generates water when burned and thus proves a greener and more renewable energy source than gas. 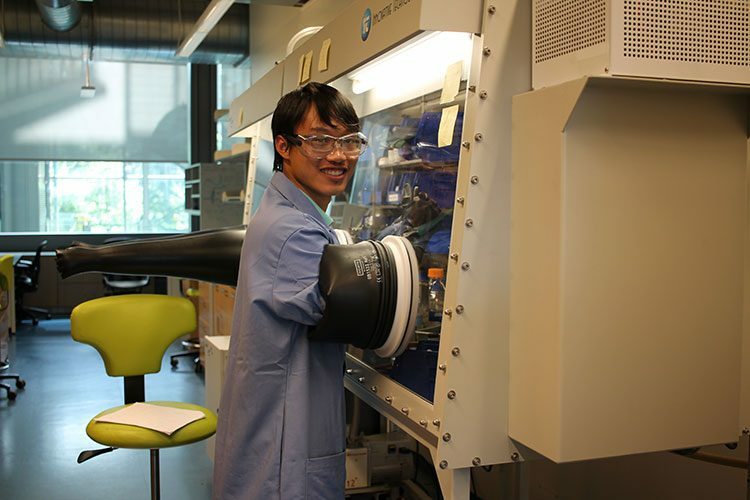 When not conducting lengthy experiments at Colgate, Le has spent his time studying abroad at Cardiff University in Wales; in the ballroom, practicing for his six Dancefest performances; and in a Princeton University lab, studying new methods of synthesis for phosphines through the Summer Undergraduate Research Program for Diversity in Chemistry. With such an extensive background in research, Le will be attending graduate school at the California Institute of Technology to study inorganic chemistry. He hopes to work as a researcher for a company, national lab, or university.